Dudley, Rio, Benson, Teddy, Captain and Oakley in their new home with Sue Upton. A herd of six mini donkeys who were relinquished into the care of a British-based charity have found a new home where they can stay together. Oakley, Captain, Benson, Dudley, Rio and Teddy, faced an uncertain future after a change in circumstances meant their owner could no longer care for them. The six were all healthy and well-loved, and had come from a good home. However, their owner could no longer care for them, and, fearing for their future relinquished them to The Donkey Sanctuary. In a stroke of good fortune “donkey guardian” Sue Upton heard about their plight and offered the herd a home with her family in Northamptonshire. Having had donkeys as part of The Donkey Sanctuary’s Rehoming Scheme for many years, Sue had plenty of experience. Sadly, her two elderly donkeys had to be put to sleep due to ongoing health problems, but when she heard about the six miniatures, she welcomed the new challenge and the opportunity to give the group a loving home. 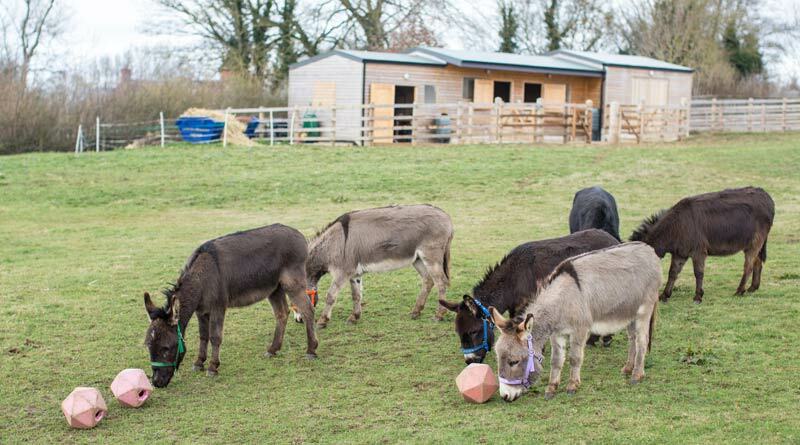 When the six arrived into the care of The Donkey Sanctuary, staff knew that the group of lively youngsters would benefit immensely from being in a Guardian home. There they would receive plenty of attention, and they could give so much enjoyment back to someone. Guardians are approved rehomers of two or more donkeys. Sue Upton with Benson and Oakley. Dudley did not want to join in for the picture. It seemed an impossible task; taking on six donkeys is a big commitment. Their ages ranged from three to 13, and although their temperaments were good they were still quite nervous, and would need someone with experience and confidence to handle them. When Sue came forward, there were no doubts that they were the perfect match. Sue takes up the story: “I have never had miniature donkeys before. They are full of it, and always keep you on your toes – they are bright, and so intelligent. The six donkeys are living the good life with Guardian Sue Upton. The Donkey Sanctuary’s welfare team worked together with Sue, to make sure she was fully prepared to care for the six donkeys before they arrived, and will be on hand to provide ongoing support should she ever need help or advice in the future. By taking on the six, Sue has not only given them a safe, loving home for life, but has also helped to free up six spaces at the Sanctuary. This allows more time and resources for donkeys already in the charity’s care, and a home to any new donkeys who may need to be rescued. Sue Upton earns the title of Guardian Angel for Donkeys! It is wonderful that she stepped up and gave them a home, so they could stay together. I love these kind of good news stories.